What happens if the Runner's stack is empty by the time they make a successful run on the server chosen with Patron. Patron's replacement effect is not optional. Patron still replaces the access, but the Runner does not draw any cards. Patron is to Wyldside what Security Testing is to Hard at Work. Wyldside and Security Testing are playable. Hard at Work is not. So is Patron? Well the first question is whether having to successfully run a server is better or worse than just losing a click. The cop-out answer to that is that it just depends on what deck you are playing. Adjusted Chronotype makes the latter just better under almost every scenario. Additionally, decks that don't make many servers can lock out (i.e. put a rezzed piece of ice in front of every server, making the cost more expensive than the reward) Security Testing and Patron where Wyldside and Hard at Work will continue working. Downside is, without Adjusted Chronotype, you just can't not lose the click on a turn where you really need all 4 clicks to do something else. So why is Security Testing playable when Hard at Work is garbage tier? Is it the cost? Well, yes. Definitely. But Security Testing isn't just playable, it's GOOD. And that's all down to cards like John Masanori, Desperado, Dirty Laundry and Datasucker: cards that trigger on a successful run without requiring access. Then you aren't really "clicking" for 2 credits, but 3 credits plus a card and a virus counter. These abilities "stack", allowing you to get more than one click's worth of actions out of a single click. Unfortunately though for Criminals - the faction that best leverages "on successful run" abilities - Patron and Security Testing are replacement abilities, which means that both cannot be used at the same time. And that means it's probably better not to run both. And for me, the choice is easy - John Masanori is half the draw of Patron at none of the cost nor the influence. But in Shaper, Security Testing is the card that comes at a hefty price. So I'm happy for a little Patronage - but like Security Testing, it'll need some influence-cheap help for it to work. DaVinci is one way, but traditional methods like Datasucker and Dirty Laundry work well too. You could even think about John Masanori, if you like running out of cards. Let me get philosophical for a moment. Security Testing (and other cards) is an excellent addition to a Criminal's arsenal because it covers up a weakness that they have without it. Account Siphon could be countered fairly well by simply rezzing all of the assets you had, dropping your credit total to zero and denying the runner any of the money they needed to trash those assets. In short, Criminal without these cards had a weakness to horizontal deck archetypes that Security Testing (and others) turned into a strength. So what type of Shaper is weak to horizontal decks? One that isn't running Astrolabe. But seriously, the answer depends on what the horizontal deck is trying to do. And the deck that's been most successful with the most number of assets, has, and will always, be Near-Earth Hub: Broadcast Center. These are fast-moving decks. Even identities like Industrial Genomics: Growing Solutions and Gagarin Deep Space: Expanding the Horizon are "fast" in the sense that they are trying to gain control of the board - and the table - before the runner can set up the tools they need to deal with them. This makes sense: if you're spending clicks playing assets, then you aren't spending them defending your central servers, which means that the longer the game goes the more chances the runner has to steal 7 points of agendas. Ultimately then, that's the deck that would most like to play Patron: a Shaper deck, that uses cards that trigger on successful runs, that is a little slow and doesn't run Astrolabe. It should also have a little more HQ pressure than your average Shaper, since that spreads the ice even thinner and reduces the chance of being locked out. 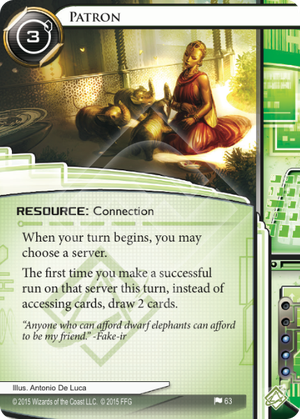 It'd better also have more Events than most Shapers as well, since most of the other types of cards are tutorable in faction, with Artist Colony and Self-modifying Code. I'm thinking Maya + Jesminder Sareen: Girl Behind the Curtain, with Vamp/Account Siphon. But you may have your own ideas. Either way though, Patron is for a deck that needs a little Kickstarting. Serious question: would you rather have a pocket giraffe or a dwarf elephant? Another serious question: would you rather have two credits or two cards? In general, the answer is "two cards". It's easier to turn cards into money than it is to turn money into cards. Point to Patron. They're both three influence. Tie point. Patron costs you three credits to install, compared to SecTest's zero. Point to Security Testing. Patron is a connection. That means you can host the elephant woman in your apartment, you can call in a favor, or tutor for her. Point to Patron. Security Testing is in faction with Desperado, while the best Patron has to offer is DaVinci. Point to Security Testing. Score: Patron 2, Security Testing 2. So it's a tie. The answer, then is to run both, in a Criminal deck with Desperado, Career Fair, Hostage, and run econ like Dirty Laundry, Account Siphon, and High-Stakes Job. In an asset-heavy meta, I can't see this card not being good. Also, Patron+Jak Sinclair is basically a Wyld-cake. It's influence-free for nobody, though, but it's more affordable for Shapers or Sunny than importing a full Wyldcake. Against glacier, it's at least a good archives pressure, something Shapers don't have much. Kit with a Yog.0 or a Refractor and some stealth money may be able to trigger Patron for free until late-game against a glacier. I don't feel it works well with Security Testing. They're both expensive to splash, and don't stack on the same . I would totally play it along Astrolabe. I never draw enough.